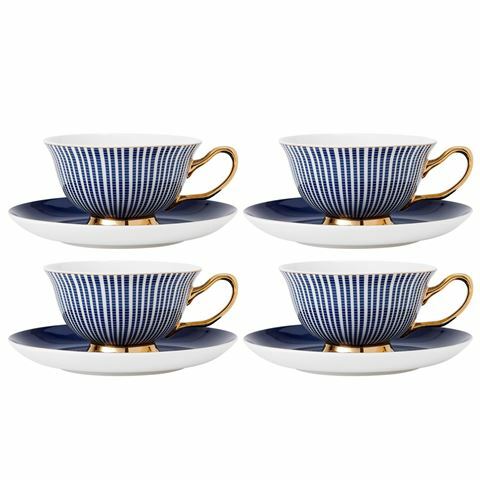 If you’ve ever wished to bring the elegance of a Parisienne café to your sitting room, Ashdene’s new Parisienne collection of tea ware is the way to do just that. With an Art Nouveau inspiration, you might imagine them in the hands of one of the great artists at the Café De Flore. We should expect nothing less from Ashdene – an Australian company who has been creating beautiful objects for our homes for over 25 years. The Parisienne collection has a lavish colour palette trimmed with gold and a classic Belle Epoque shape to accommodate even the frothiest coffee or the most robust tea. Live it up with Ashdene’s Parisienne Collection. High gloss with gold embellishments. Inspired by the Art Nouveau period. Presented as a set of four in a stylish Parisienne gift box. 4 x 15.5cm – Saucers.